Otaki Foodbank has been helping families in need in Otaki for more than 25 years. From small beginnings in 1988, by a group of concerned parishioners from local churches, the Otaki Foodbank now provides around 1500 food parcels every year. The Foodbank has had many homes since its inception, starting off as an emergency food service operating out of the Anglican vicarage, to rooms at the former women’s hospital, to the budgeting service rooms and finally in the centre of the town. Demand for parcels is very heavy over the Christmas period and early in the year as families face the challenge of the costs of children returning to school. Increasing rents and the cost of power and food put enormous pressure on many families. Genuine people in need are always welcome at the Otaki Foodbank, but there is strict eligibility criteria. Customers must be referred from Work and Income, the Otaki Budgeting Service or Health services. The Foodbank is run entirely by volunteers, with manager Lucy Tahere clocking up many years at the helm. A committee of volunteers provides governance and organises funding. A lot of funding for the Foodbank is provided from Pub Charity Lotteries Commission and community organisation grants. 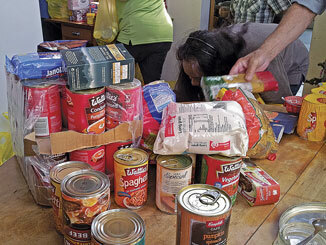 The Foodbank also gets regular donations from local churches and individuals. Food is donated at collection points in local supermarkets and from food drives by churches and community groups. Locals often drop off excess produce to add to food parcels.Each food parcel contains basics such as milk, bread and meat. These are bought from local suppliers by the Foodbank each week. Money is also needed to cover rent and the cost of power and phone. The Foodbank has helped a wide range of people in Otaki over the years. Many of those like to give back to the Foodbank when their circumstances improve. Recently a mother, parenting on her own, donated money to the Foodbank as a thank you for the help she had received when she was in need. Any cash donations for the Foodbank would be gratefully received and greatly appreciated. Donations are tax deductible and a receipt is issued. Please call into the Foodbank on Main Street next to the Post Shop on Tuesday, Wednesdays and Friday between 9.30 and midday or email otakifoodbank.co.nz for further information.